With nonstop development of modern society, online shopping now is very popular for everyone. If your product is not seen on internet, you will lose a huge number of customers. 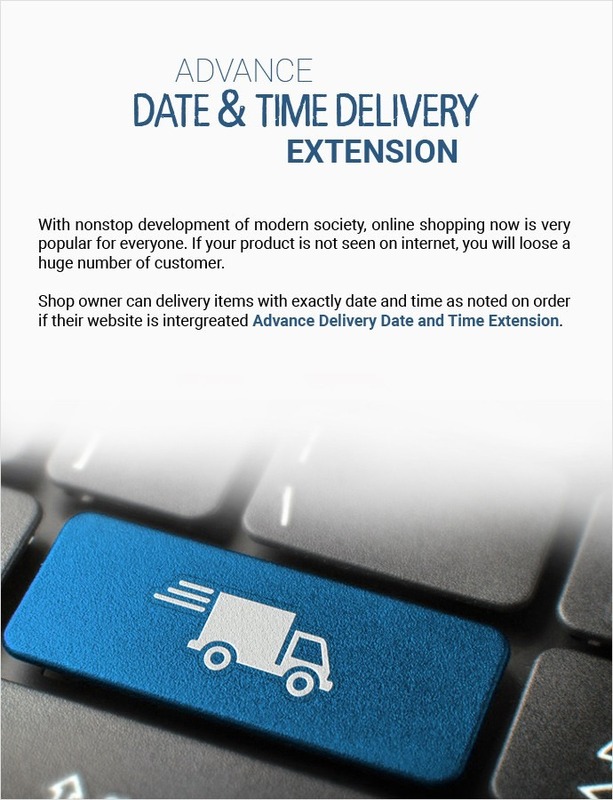 Shop owner can delivery items with exactly date and time as noted on order if their website is integrated Advance Delivery date and time extension. 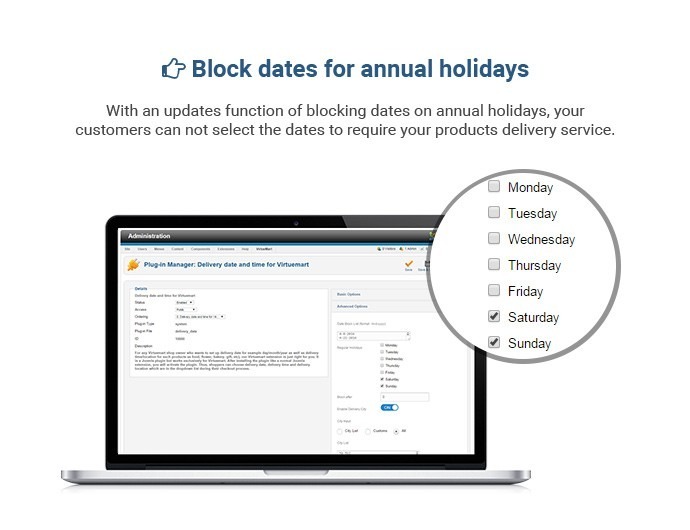 This module will show shipping day, date and time in a calendar to the customers. This will help them change or reschedule their delivery day, date or time in case they are preoccupied in specific date and time slot. Apart from this customers would also receive the shipping date, day, time and related comments made by them for specific purchase through confirmation email. They can also select different dates and shipping addresses to order multiple products through calendar view. This will make them doubly sure about the delivery information, avoiding any confusion! Step 3: Go to Payment and Shipment, choose receive time. With each location, you choose different date depends on shop owner aim. Step 1: Login on back-end and install this extension. Step 2: Go to Plugin enable extension and setup delivery date. You can set up many types suitable for your site. Step 3: To setup advance Delivery City, Go to components, and then choose delivery city to setup. Or you can setup delivery date in many different countries, states or zip code. You also can combine 3 things if you want. 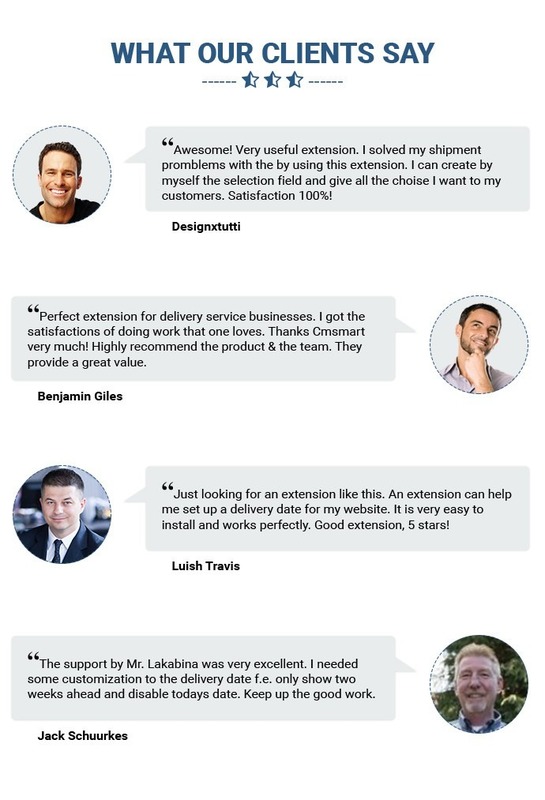 This extension is the best choice for your site, when you setup, you not only manage easily but also have more various customers with different delivery time. Customizable layouts - Titles' colors, labels and borders are customizable. 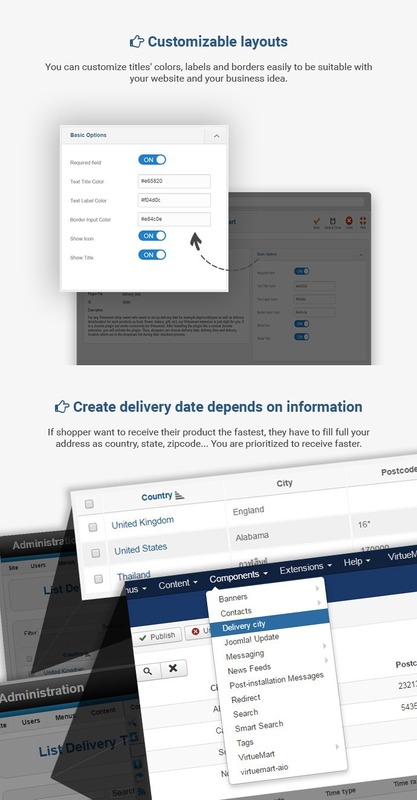 Create delivery date depends on country, state, specific zip code (11111, 22222), general zip code (14*, 15*) - If shoppers want to receive their product the fastest, they have to fill full your address as country, state….. You are prioritized to receive faster. 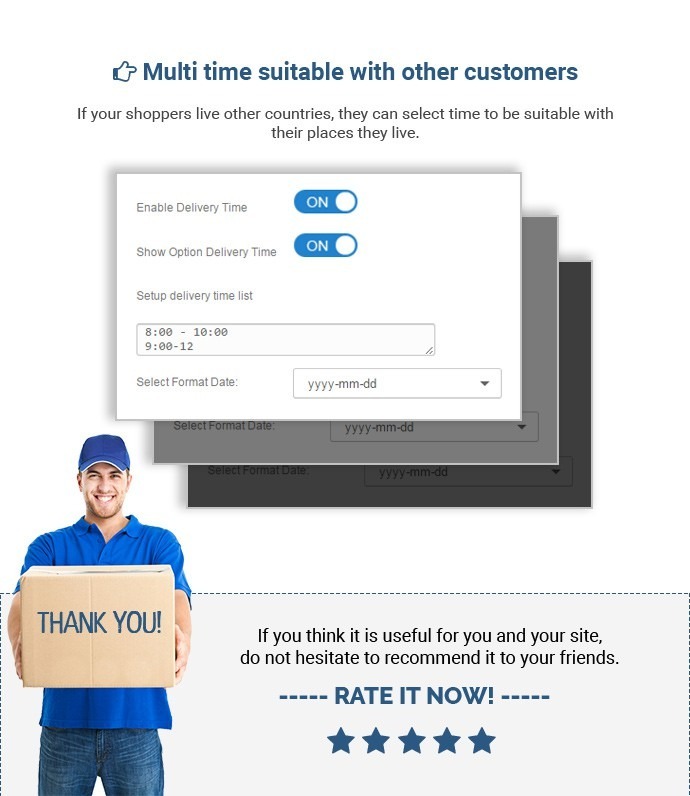 Select multi time to suitable with other customers - If your shoppers live other country, they can select time to suitable with their place they live. 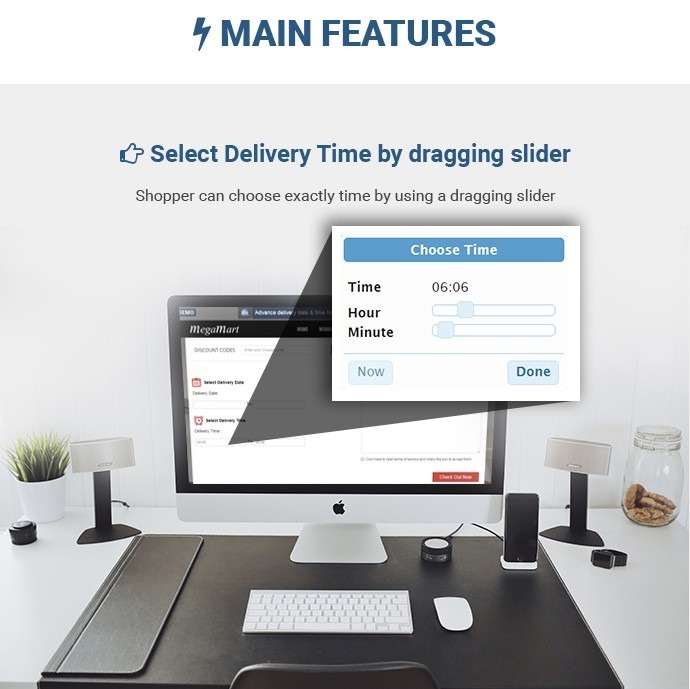 Choose delivery time from a time slider - Shoppers can choose delivery time from a time slider. If they don't want, they can fill time in a box. Support is really great, beside solving your problems they are always open to talk about ideas and actually implementing them. Very nice support, solved the issue really fast, very happy with it. thanks. Great support! Very fast, helpful and effective! CMSmart is developing Joomla extensions that you cannot find anywhere else! Thanks a lot! This extension makes my online flower store become unique among the crowd. The sale revenue increases along with the customers satisfied. give you 5 stars for quality! Perfect extension for delivery service businesses. I got the satisfactions of doing work that one loves. Thanks Cmsmart very much! Highly recommend the product & the team. They provide a great value. Nice plugin, I got little problems with this plugin vs my template. I mailed the support group and they fixed it really fast! Good work Guys! Nice plugin, easy to use. We had some problems to show the date as dd-mm-yy, but the support is great and fixed it. Nice work. The support is Excellent. Every issue i had was solved within 24 hours. Integration with Joomla is Excellent. The code is so clean that it is easy to customize. No hacks but really a Joomla plugin. The support for this plugin is great so far. It will be great if they can add more features to the plugin such as controlling the available delivery time from backend. This plugin is absolutely fantastic, but what makes it even better is the support that you get from CMSMart. I needed some customization, and it was done very fast and worked the first time out. I highly recommend all of the wonderful extensions by CMSMart! The support by Mr. Lakabina was very excellent. I needed some customization to the delivery date f.e. only show two weeks ahead and disable todays date. 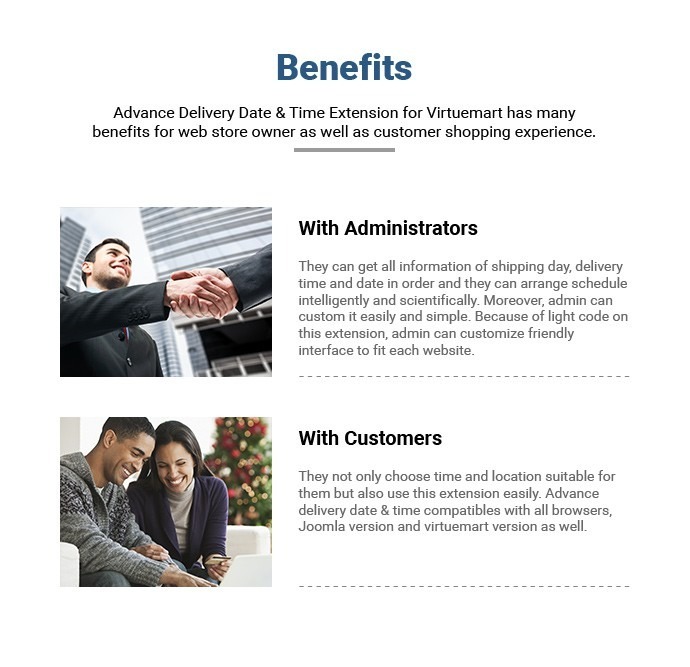 I can recommend the Virtuemart extensions from CMSMART. I find more and more that partnering with the right people yields the best results - that is why I am so pleased to give this review. The team at CMS Mart are professionals who will stand by your side to make sure you get the best out of their extensions - they go the extra mile and in my book that makes them outstanding partners and I Highly Recommend them! I bought the plugin Delivery Date for VM and the implementation is a bit more complex, the need for various adaptations for use in combination with a component from another vendor. However, the support team, especially Mr. Paul, met me with all the attention and resolved all difuculdades. As a result, my system works perfectly! Congratulations to the developers and support! Recommend! 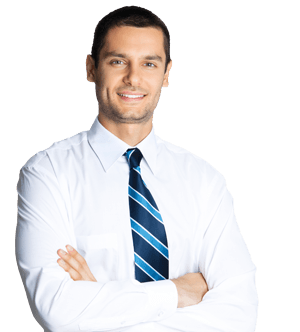 The support is polite and try to help and solve clients' problems as soon as possible. Thank you! 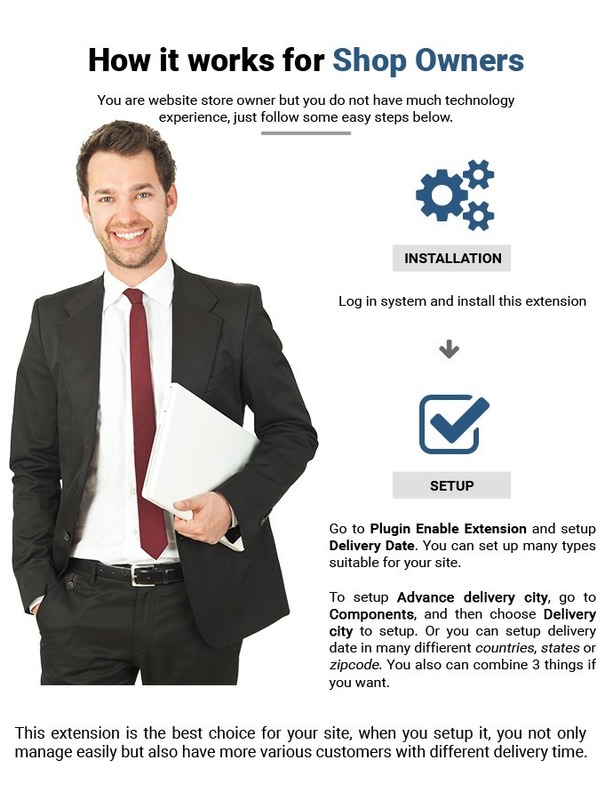 I purchased this VM Delivery Plugin with CMS's VM Onepage plugin for a florist eCommerce site to improve. And now fully satisfied! Warrior Hoàng from the support team helped me along the way to resolve many technical issues, lightning fast support! Highly recommended! Just looking for an extension like this. An extension can help me set up a delivery date for my website. It is very easy to install and works perfectly. Good extension, 5 stars! This product is perfect, I installed easy, it's is update information is very good in the process. I will buy many products of CMSmart! very good extensions. this product help me save time when I set up time delivery time and location for customer. my customer is very happy and they comeback my site to purchase many product. thanks. 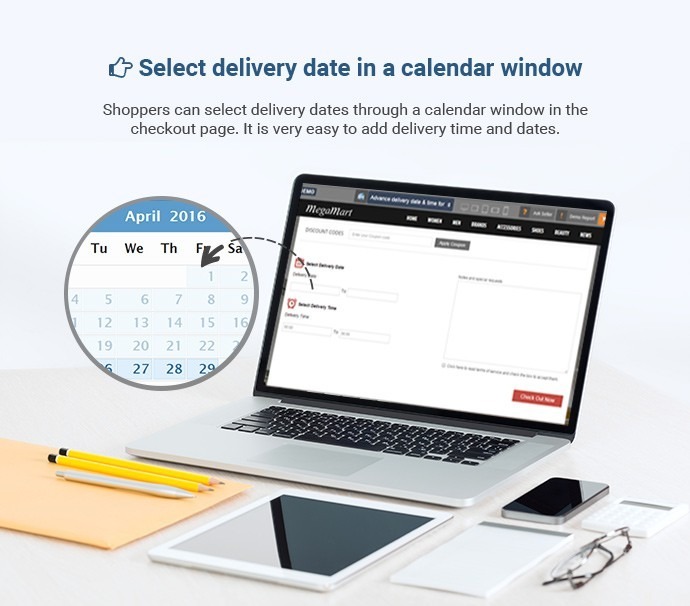 Shoppers can choose delivery dates, delivery time and delivery locations in a list during their checkout process,so every order is delivered on time. It is this that customers trust in our website more, THANK YOU VERY MUCH ! 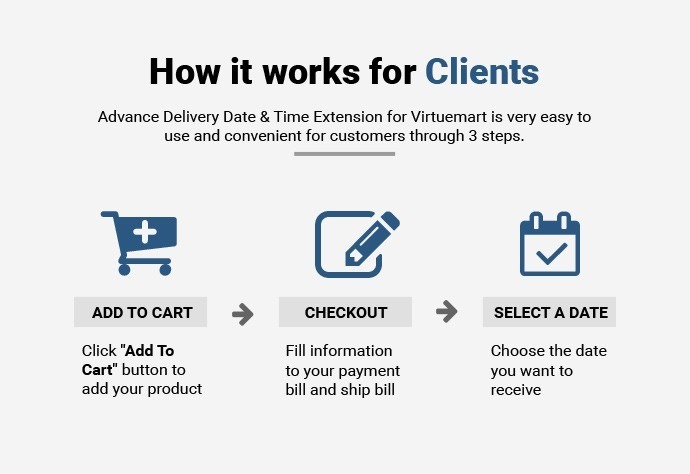 Your job is setup this product and all the rest is the date of the Product Delivery for Virtuemart 3 plugin, so wonderful. I have used and completely trust. My customers are satisfied with this product, they can set the date and time, location receive goods easy, and I'm also easily manage their orders. Hi, I want to buy this plugin, but I nedd for J25 and VM2.3 too. Can You send me this ersion (I think 2.X) for me after pay? I am Vincent from CS department- My pleasure to support you in this case. Is it possible for admins to set a cut-off date/hour ? 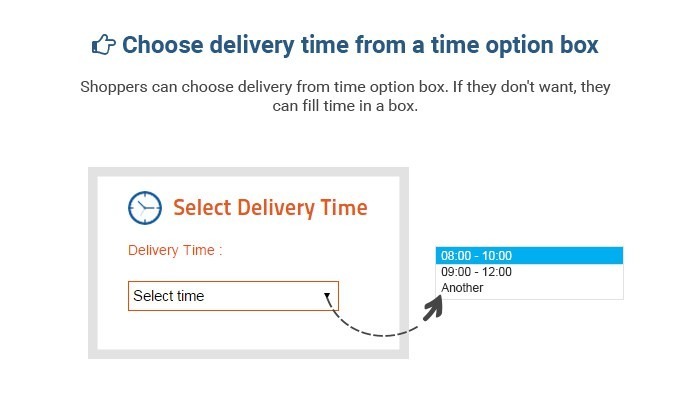 For example: a customer would have to order before a specified time in order to be able to deliver the next day (or even 2 days). Does your plugin support the below scenario. The first option is to choose time with extra cost for example 3 euros and the second is to choose a specific day, for example Saturday with extra cost 5 euros. Many thanks for your interest in our products. I am Vincent from Customer Service Department. I am so sorry to say that our product does not support this feature. Maybe we will make an update for the next version in the future. If you have any questions more, you can contact me via Skype: Vincent@cmsmart.net for a quick response. Can I associate a list of different time intervals for each city? Our plugin can do your request so don't worry about that. If you have any confuses, don't hesitate to let me know. can I ask if by adding this extension to my joomla website, will I be able to set different price for different days of a week in virtuemart shipping options. I'm sorry to say that our extension doesn't support this function at this time. We will develop this function in the future. Can I use this Plugin with joomla 3.6 + VirtueMart 3.0.16? Hi, I have joomla 3.6 + VirtueMart 3.0.16 in Template Joomlart. Can I use this Plugin? Thank you so much for your trusting with us. Yes, our product can work on Joomla 3.6 and Virtuemart 3.0.16. About Template Joomlart, you don't worry, if it has problems, our developer will help you resolve it. Hi Janet !!! Sorry for my bad English, I speak Spanish. - How long does the license last? - Is it for life? - I do not need to renew, only if I want to do it? - What license should I buy? "AUTO RENEWAL" or "STANDARD PAYMENT"
The calendar must be to enter product by product or it is automatic for all. Can I login to backekd? - When you purchase our theme, you can use for a lifetime. But with Auto Renewal: you only pay for a recurring fee every 6 months. When you pay this fee, you will be download, upgrade and receive our support FREE every time. This is different with Standard payment, you pay once, you also receive our support, download and upgrade FREE in 6 months, after 6 months, if you want to download, upgrade you need to buy it again. About calendar, it is automatic for all. So I hope that you will buy our product with Auto Renewal option. Hi, I would like to know where can I see the delivery date in the backend, can I see it in the order list? I am Janet, working as Senior Customer Service Manager on Cmsmart marketplace. Could you tell me clearly what you want? Do you want to login in back-end our demo? Please let me know. You can send message for me via email or my skype. Thank you so much for interested in our product. I have discuss with our developer and found that this product totally compatible your request. So you please rest assured and choose it. Looking to hear your purchase our product. Is there the posibility to preset some intervals at Time Delivery? Thank you so much for interested in our product. You totally assured, this product can preset some intervals at Time Delivery as you want. Please purchase our product to have interesting experience. Looking to hear your purchase. Our product works very good with default one page of Virtuemart and opc checkout. However, works with Rupostel OPC can conflict, incurred. But rest assured, we will support for you. # Fix bug of displaying and hiding properties in admin configuration, icon and text overlapped. # Fix bug of not printing delivery date and time on checkout page successfully. + Able to pick up an interval for product delivery.